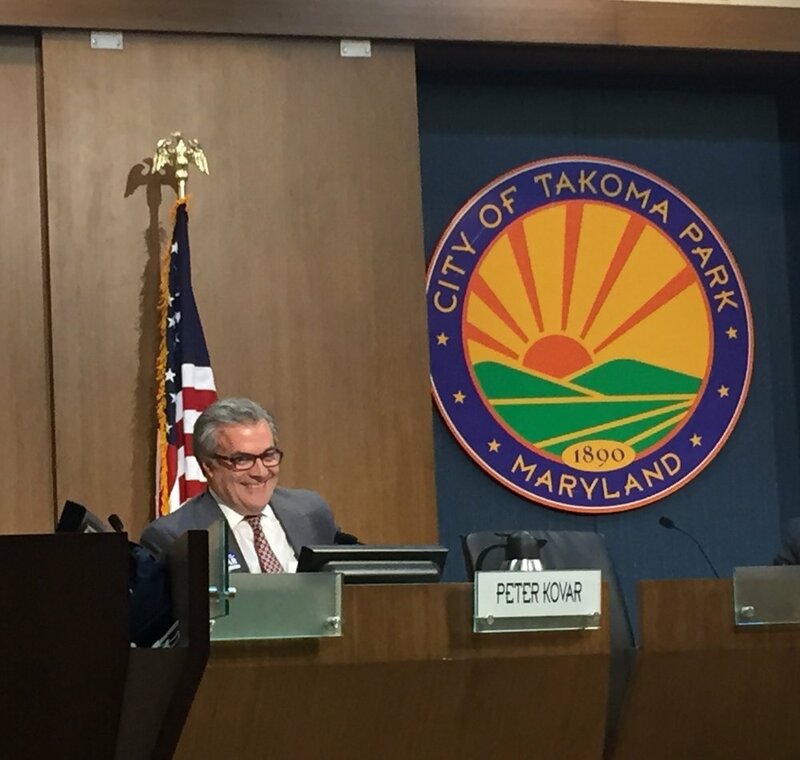 Here’s a link to the City Council agenda for November 28, 2018: https://takomaparkmd.gov/meeting_agendas/city-council-meeting-agenda-wednesday-november-28-2018/. With no Council meeting last week due to Thanksgiving, and only two more meetings this year (this week and December 5), we’ll have packed agendas for both (which also means -- yes -- a substantially longer than usual write-up this week). A key item Wednesday night will be the work session discussion on Cell Tower legislation. Of interest especially to many North Takoma residents will be the presentation on the Montgomery College Math-Science Building. Voting items include: a budget amendment; the proposal to dedicate net rents from the Takoma Junction project to the City’s Affordable Housing Fund; a subdivision on Ethan Allen Avenue; an Energy Efficiency contract for multi-family apartments; and a resolution on moving ahead with the New Hampshire Avenue Recreation Center Land Exchange. There will also be a single vote on a Consent Agenda composed of five separate items: a Folk Festival contract; a Police Department Dispatch Console purchase; and three resident committee appointments. We’ll also have presentations on the Fiscal Year 2018 Financial Report and on the Police Employees’ Retirement Plan. In addition to the Cell Tower issue, the work session will include discussions on the City’s Cultural Plan, and on a proposal to allow residents as young as 16 to serve on resident committees. Public Meeting on Takoma Junction Project -- Junction developer NDC has scheduled a pre-submission public meeting on Tuesday, November 27, at 7:00 PM in the Takoma Park Middle School cafeteria to review the proposed Site Plan and Preliminary Plan applications. This meeting is required before NDC can submit the plans into the County review process. Cell Tower Teach-In -- There will be a Community Teach-In on Small Cell Towers sponsored by Community Vision for Takoma on Friday, November 30, from 7:00 - 9:00 PM at the Takoma Park Volunteer Fire Department. Because of a previous engagement I’m unable to attend. Public Hearing on Cell Towers -- On December 5, the City Council will hold a public hearing on proposed City Code amendments to regulate installation of Cell Towers in City rights of way. The hearing will begin at 7:30 PM in the Community Center Auditorium. Anyone can speak for up to three minutes. Vacant House Checks -- With the year-end holidays approaching, it’s a good time for a reminder about this Police Department service. If you’ll be out of town for at least four days (maximum 30 days), the Takoma Park Police will check your home in the City while you’re away, free of charge. Call: 301-270-1100 for information or to sign up. Update from November 14 Council Meeting. After several Council sessions on proposed amendments updating the City’s Purchasing Code, further work on this topic has been postponed until next year. There were a number of questions still to be resolved about threshold expenditure amounts that would require Council approval as opposed to falling within staff authority, and -- with no specific deadline for the Code update -- we’ll get back to it when time allows in 2019. 2018 Annual Financial Report: https://documents.takomaparkmd.gov/government/city-council/agendas/2018/council-20181128-1.pdf. This will be a presentation by the City’s auditors on Takoma Park’s Comprehensive Annual Financial Report. It’s a lengthy document, which I’ll continue going through in the lead-up to the meeting. I’m pleased that CohnReznick, the auditing firm, did not identify any deficiencies in the report. Police Employees’ Retirement Plan: https://documents.takomaparkmd.gov/government/city-council/agendas/2018/council-20181128-2.pdf. Each year, an outside firm reviews the financial condition of Takoma Park’s Police Employees’ Retirement Plan, and prepares a report that sets forth the actuarial valuation of the Plan, and calculates an Actuarially Determined Contributions amount for the coming Fiscal Year. In its annual budget, the City generally includes this amount (or more) in its annual budget for this purpose. We’ve done that every year I’ve been on the Council, and I assume we will again when we develop the budget in the first half of 2019. Montgomery College Math-Science Building: https://documents.takomaparkmd.gov/government/city-council/agendas/2018/council-20181128-3.pdf. There has been ongoing debate about the location and design of MC’s new Math-Science Building. While there were several sites under potential consideration for siting of the structure, the College selected a location closest to the residential areas of North Takoma: where the Falcon Hall and Science South Buildings are located (near the intersection of Takoma Avenue and Fenton Street across from Belle Ziegler Park, and stretching along Fenton). The building will be substantially larger than the existing structures there, and a number of residents registered their opposition to the location because of the building size and its proximity to the residential area, along with the impact construction would have on the neighborhood. I share those concerns, and expressed opposition to this location during the site selection process. Since July, the focus has been on a community design charrette process for the site. The charrette has led to a proposed design the College will be submitting to the County Mandatory Referral Process. The City can offer its comments on the design through a resolution, which we’re tentatively set to take up in our December 5 Council meeting. The resolution hasn’t been drafted; its contents would be based on our discussions in this week’s meeting. There are a number of concerns about the design, especially around the building’s mass, height, and footprint. I expect these points will be prominent in our discussion this week and they may be included in our resolution. One aspect of the design that’s more encouraging is that it extends the setback at the Takoma-Fenton intersection compared to the current structures. This is something I’ve urged the College to agree to, and if this feature were to be retained in the final design it would help ensure preservation of the trees around the intersection and the visual connections to Belle Ziegler Park. Budget Amendment: https://documents.takomaparkmd.gov/government/city-council/agendas/2018/council-20181128-4.pdf. I supported the amendment when we gave initial approval to it on November 14, and I’ll be voting yes again on this final vote. Takoma Junction Rents: https://documents.takomaparkmd.gov/government/city-council/agendas/2018/council-20181128-5.pdf. When the Council approved the Junction site plan resolution in July, we included language calling for revenues from the rent of the Junction site to be directed into the City’s Affordable Housing Fund. While I did not support the site plan resolution, I agree with the idea of providing more financial support for the Housing Fund. And with NDC now paying rent to the City for the Junction property, I think it makes sense to initiate the flow of money into the Housing Fund, so I’ll be voting for this proposal. When we finalize the details of our broader Housing Strategic Plan, we’ll be able to incorporate these Junction dollars into that larger Plan, and at that time take steps to ensure that they supplement rather than possibly displace other monies dedicated to the Housing Fund. Ethan Allen Avenue Subdivision: https://documents.takomaparkmd.gov/government/city-council/agendas/2018/council-20181128-6.pdf. The County controls re-zoning plans of this type, and the City has the right to offer its views through a Council resolution. Although there was no commitment in our November 14 Council meeting from the owner of the property as to the selling price for the three new houses to be constructed on this site (430 - 434 Ethan Allen Ave.), I believe that in general it’s beneficial to the City for there to be more housing opportunities. So I’ll be voting in favor of the resolution. Multifamily Energy Efficiency Contract: https://documents.takomaparkmd.gov/government/city-council/agendas/2018/council-20181128-7.pdf. This contract is for an outside firm to assist six multifamily apartment buildings in the City in operating their centralized heating/hot water systems more efficiently in order to continue advancing Takoma Park’s sustainability goals. The funding ($70,000) is in the City’s budget and will cover a 20 month period. I support the contract and will be voting for it. Takoma Park Recreation Center Land Exchange: https://documents.takomaparkmd.gov/government/city-council/agendas/2018/council-20181128-8.pdf. The Council has devoted several sessions to the idea of replacing the New Hampshire Avenue Recreation Center with a larger, updated facility that would potentially also include housing opportunities and other community space. The site is currently controlled by Montgomery County, but an exchange of land between Takoma Park and the County that would allow the City to take ownership of the Rec Center site has been provisionally agreed to. This resolution, which I support, would formally set in motion the land exchange, with a July 1 target date for completion. One key outstanding question is the extent to which the City may have to take on more of the cost of recreation activities at the site, and I’m hopeful we’ll get some clarification on that point during this week’s meeting. CONSENT AGENDA. I’ll be voting in favor of the consent agenda. Cultural Plan: https://documents.takomaparkmd.gov/government/city-council/agendas/2018/council-20181128-10.pdf. This will be a discussion on a proposed update of the City’s Cultural Plan, covering the next five years. The plan was first formulated in 2006. Minimum Age for City Committees: https://documents.takomaparkmd.gov/government/city-council/agendas/2018/council-20181128-11.pdf. Since we allow residents as young as 16 to vote in local elections, and our Youth Council has even younger members, we’re looking at lowering the minimum age for membership on resident committees to 16. I support the concept. Small Cell Towers: https://documents.takomaparkmd.gov/government/city-council/agendas/2018/council-20181128-12.pdf. As I’ve detailed in previous messages, the City is considering how to respond to the recent FCC ruling that significantly constrains our ability to impose limits on small cell towers in our public rights of way (ROW). Under our current zoning system, the County controls zoning (including placement of cell towers) on private land, with the City controlling our ROWs (except on State Highways). We’re continuing to explore the legal aspects of the interplay between County and City authority. Meanwhile, we’re working to establish the strongest possible protections for the community on small cell towers — in the context of the FCC ruling, Federal legislation and court decisions — in such areas as health impacts, aesthetics, fees, public notification, permitting requirements, etc. Our tentative plan is to discuss in this week’s Council meeting the details of a potential ordinance addressing these and other points, along with a resolution expressing the Council’s overall goals for our response to the FCC. Then, at our December 5 meeting we’d be able to vote on the resolution and have an initial vote on the draft ordinance, followed by a final vote on the ordinance on January 9, our first meeting in 2019. That schedule is not certain, and I encourage residents to offer opinions on this issue, directly to me via email and/or by participating in the December 5 public hearing.